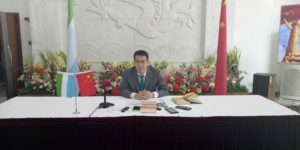 Charge d’affaires at the Chinese Embassy in Sierra Leone, Wang Xinmin, has stated that Sierra Leone has over the years benefited lots of goodies through the China-Sierra Leone Cooperation, adding that more benefits are coming to further strengthen the friendship. Wang Xinmin made the above assurance on Wednesday, March 27th ,during a presser at their Embassy on 29 Spur Loop, Wilberforce in Freetown, while updating journalists about the China Two Sessions (Parliaments in China) that met earlier in this month and the recent major cooperation plan between China and Sierra Leone. He said in February 2019, the then Chinese Ambassador to Sierra Leone, Ambassador Wu Peng and Sierra Leone’s Minister of Foreign Affairs and International Cooperation, Dr. Alie Kabba , signed an agreement on the Economic and Technical Cooperation Between the two countries. He said in the agreement, China agreed to provide Sierra Leone with gratuitous assistance of 200 Million Yuan (equivalent to about 30 Million US dollars) to explore and implement the Fish Harbour Project, noting that Chinese companies were currently negotiating the MOU with the Ministry of Fisheries on the shore facilities for the investment. He also cited a 30 million United States Dollars project to lay a 721.5-kilometer fiber-optic network covering 15 major cities in the northern, eastern and southern region of Sierra Leone. He said China was only waiting for Sierra Leone to confirm the project and prepare relevant information at the request of the Export-Import Bank of China, after which China would continue to promote the follow-up work of the project together with Sierra Leone in accordance with due procedures. He further that with a view to further developing the friendly relations between the Armed Forces of China and Sierra Leone, the Chinese Ministry of Defense decided to provide 50 million RMB Yuan military aid gratis to the Republic of Sierra Leone Armed Forces, noting that the gratis will be utilized for the refurbishment of military officer’s quarters, mess and others. He said to provide better training services to career diplomats, Sierra Leone government has proposed to construct a Foreign Service Academy by using Chinese Government Aided Fund, and as a partner who always acts swiftly to the requests of Sierra Leone, China was actively studying the project. He disclosed that in 2018, more than 1,300 Sierra Leoneans went to China for various training programmes, with the sponsorship of Chinese government. He added that more than 100 Sierra Leonean students further their studies in China through the Chinese Government Scholarship programme, noting that this year, the programme was also in process with a growing number of applicants. He said agriculture has been one of the top priorities under the New Direction government agenda and that China, as a great agricultural country, was willing to share its experience and strengthen cooperation with the Sierra Leone in agricultural development, while actively studying agricultural cooperation projects. Giving update on China’s developmental achievement, Wang Xinmin said as of March 25, 2019, China has signed 172 cooperation documents with the 124 countries and 29 international organizations to jointly build “The Belt and Road” initiative. He said the Belt and Road Initiative (BRI) is an immensely ambitious development campaign by China to boost trade and stimulate economic growth across Asia and the rest of the world. He said the Belt and Road Initiative originates from China but belongs to the world and it involves countries in different regions, at different development stages and with different cultures, adding that it was a platform for open and inclusive cooperation and a public good they jointly provide to the world. The Chines diplomat continues that from 2013 to 2018, China’s total imports and exports volume with countries along the Belt and Road reached $6,469.19 billion and created 244,000 jobs for the local areas, adding that the value of newly signed foreign contracted projects exceeds $500 billion. He said they have established 82 economic and trade cooperation zones outside China Chinese foreign direct investment, which exceeded $80 billion, noting that the cumulative amount of taxes and fees paid to the host country is $2.01 billion. He said in 2018, China’s GDP grew by 6.6%, exceeding 90 trillion yuan and consumer prices rose by 2.1%- a basic equilibrium in the balance of payments was maintained and further 13.61 million new urban jobs were added. He said the surveyed unemployment rate remained stable at a comparatively low level of around 5%. He said the consumption continued to play an increasing role in driving economic growth and service sector’s contribution to growth approached 60% growth in high-tech industries and equipment manufacturing outstripped that of other industries and harvest were again good and energy consumption per unit of GDP fell by 3.1%. He said a number of major scientific and technological innovations were made and emerging industries thrived with traditional industries seeing faster transformation and upgrading Business start-ups and innovation continued to surge nationwide, with an average of over 18,000 new businesses opening daily and the total number of market entities passing the 100 million mark. Wang Xinmin said the rural poor population decreased by 13.86 million, including 2.8 million people assisted through relocation from inhospitable areas. He said Per capita disposable personal income grew by 6.5% in real terms and that close to 100 million payments were made to assist students from families in financial difficulty, covering all school types and more than 6.2 million housing units were rebuilt in rundown urban areas with 1.9 million dilapidated rural houses renovated. He said another 4,100 kilometers of high-speed railways opened to traffic, with over 6,000 kilometers of expressways and more than 300,000 kilometers of rural roads built or improved. He said they used multiple channels to achieve stable and expanding employment, providing training for over 15 million people, upgrading their skills or switching jobs or industries, expanding enrolment at vocational colleges by one million, reducing the tax burdens on and social insurance contributions of enterprises by nearly two trillion yuan.